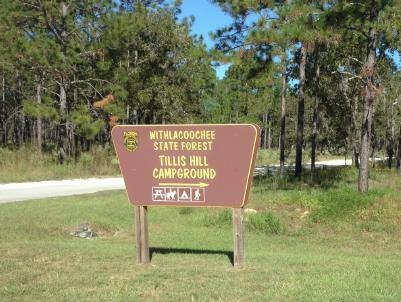 The Tillis Hill Recreation Area is a part of the 50,000 acre Citrus Tract of the Withlacoochee State Forest. It is centrally located in the south range of the Citrus Tract southwest of Inverness.. This area is also part of the Citrus Wildlife Management area where hunting is allowed. It's always a good idea to wear bright colored clothing during hunting seasons. 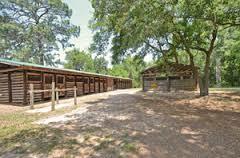 Tillis Hill Recreation Area and campground is specifically designed with the equestrian user in mind. The campground includes 37 campsites with paved slabs, electricity, water, picnic table and fire ring or free standing grill. There is also a stable with 36 horse stalls, including two designed for stallions, and a communal corral. An RV dump station is also available at this location. There are two bathhouses with restrooms and shower facilities. A covered pavilion, barbecue grill/smoker, and a dining hall (or meeting room) are all available for rental by registered campers. Horses must be quartered in stalls or the corral, and trailers parked in the designated area. Horses and trailers are not allowed in the campground. No dogs are permitted at Tillis Hill Recreation Area. A variety of horse trails - 50 miles in all - are available, and meander across virtually all parts of the Citrus Tract (see map link below). Seven of the trails are loop trails of varying length that interconnect with each other. Using various combinations of these trails, you can ride a 12 mile one day route, or a two day 24 mile route with a stop-over at a primitive campsite. All trails are plainly marked with a blue band blaze that makes a complete circle around the tree trunk. In addition to the equestrian trails, the Citrus "D" loop is a 13.5 mile hiking trail that circumnavigates the Tillis Hill Recreation Area. And the south leg of the Citrus "C" loop trail also passes just to the north of Tillis Hill. There is a first-come, first-served primitive camping area at the southern most point on the Citrus "D" loop trail. All the hiking and equestrian trails wind through a variety of natural communities, including sandhill scrub, longleaf pine stands, and rocky hammocks. lowland portions may be wet during rainy season. The Florida National Scenic Trail also winds through this area from north to south. You can reach it by hiking east along forest road Trail 20 from the Tillis Hill campground.